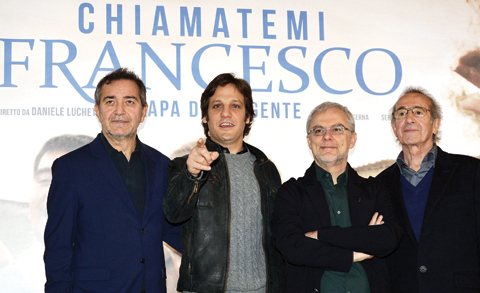 (From left) Producer, Pietro Valsecchi, Argentinian actor Rodrigo de la Serna, Italian director Daniele Luchetti and Chilean actor Sergio Hernandez pose during a photocall of the movie “Chiamatemi Francesco, il Papa della gente” (Call me Francis, the Pope of the People). The challenges faced by Pope Francis during the dark years of the Argentine military dictatorship (1976-1983) are portrayed in a new film, “Call Me Francesco”, which will have its world premiere at the Vatican today. The film tells the story of the life of Jorge Mario Bergoglio, from his youth to his election as head of the Roman Catholic Church in March 2013. During the 98-minute biopic the audience gets a glimpse into Bergoglio’s life as a young man in Buenos Aires, surrounded by Peronist friends and with a girlfriend he came close to proposing to before getting his calling to become a priest. Luchetti’s film focuses on the character of Bergoglio, depicting him as an authoritarian but sensitive personality. At the height of the dictatorship’s repression, it shows the future pope hiding persecuted students in his seminary, helping people escape to exile and consoling the so-called “Mothers of the Plaza de Mayo” whose children were “disappeared” by the dictatorship. Luchetti insists he has produced a realistic and balanced portrayal of the characters and events covered by the film. Those who still believe Bergoglio could have done more to speak out against the regime may not agree as the film largely steers clear of the issue of Church silence in the face of the dictatorship’s use of torture and extrajudicial killings to silence dissent. In one of the film’s key scenes, Bergoglio is portrayed as obeying orders from above when he withdraws Jesuit protection for two priests, Daniel Iorio and Francisco Jalics, after they refuse to stop their work in one of the city’s poorest areas. The Jesuits fear the dictatorship will associate the priests with the extreme-left movement. Without protection the men are kidnapped and tortured and, in real life, later accuse the future pope of betraying them. Pope Francis, 78, is played by two Latin American actors: the Argentine Rodrigo de la Serna, (“The Motorcycle Diaries”) in his period as a priest and bishop, and the Chilean Sergio Hernandez (“Gloria”) as the pontiff in his more recent years. “It was a huge responsibility because of the historical and spiritual dimension of the character,” said Serna, adding that while playing the role he got in touch with his own spiritual side and “learnt how to pray”. The Italian production cost $15 million (14 million euros) and was filmed over 15 weeks in Argentina and Italy. “We want ‘Call Me Francesco’ to be a film of reference,” said producer Pietro Valsecchi, who commented that they did not have the Vatican’s blessing to make the film.